Mindful of the discussion above, it is clear that when one is probing the conformation of an oligofuranoside, the critical first issue to be addressed is that of the confor-mational equilibrium of the constituent monosaccharide rings. Once this equilibrium is understood, the three-dimensional orientation of the sugar residues relative to each other can be assessed to provide an overall picture of the shape of the molecule. In recent investigations , the equilibrium populations of ring conformers in methyl a-d-arabinofuranoside (24a, Fig. 8) and a series of related di-, tri-, and tetrasac-charides (13, 16, 18-21 , Fig. 6) have been studied. These investigations have led to a better understanding of d-arabinofuranose ring conformation and have allowed the determination of the effect of ring substitution on conformer equilibria. High-field (600 and 800 MHz) NMR spectroscopy has been used for these studies. The oligo-saccharides of interest contain only a-d-arabinofuranose residues, and consequently the potential for spectral overlap is high. However, in all the compounds studied to date, the spectral resolution at these field strengths has been good enough that standard one- and two-dimensional experiments (e.g., 1H-1H COSY, 1H-1H TOCSY, HMQC) can be used not only in assigning all the 1H and 13C resonances, but also in the measurement of coupling constants. Once the couplings have been obtained, PSEUROT analysis has provided conformer identities and their populations. As illustrated in Figure 22, this analysis has identified that the ring in 24a adopts a roughly equimolar distribution of the °T4 (N) and 2T3 (S) conformations. In both these conformers the anomeric methoxy group is oriented in a pseudoaxial orientation, as would be expected on the basis of the endo anomeric effect. Furthermore, in both conformers the hydroxymethyl group lies in a pseudoequatorial fashion, as would be favored on the basis of steric interactions. In the N conformer, both the secondary OH groups adopt sterically favored pseudoequatorial orientations; however, in the S conformer, these groups are pseudoaxial. Although conformers possessing this orientation of substituents might not be expected to be energy minima on the basis of sterics, gauche effects  between these hydroxyl oxygens stabilize this conformer. Similar effects have been observed in the furanose rings of nucleic acids . Comparison of the two solution conformers with that of the crystal structure  of octyl a-d-arabinofuranoside (66) and 24a  reveals that the rings in these crystals adopt a conformation (E4) very similar to the solution N conformer. Figure 22 Solution N and S conformers for 24a as determined by PSEUROT analysis. ducing end residue behaves like the monosaccharide, the reducing end residue is profoundly affected by glycosylation. In the 3-O-substituted ring, the S conformer remains at 2T3 but the identity of the N conformer changes, slightly, to °E. 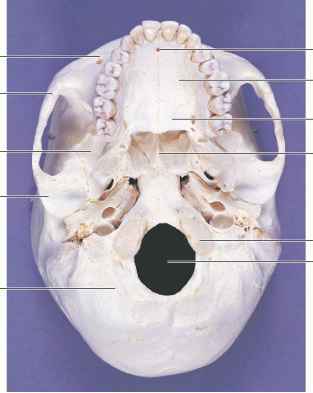 In addition and more strikingly, the N conformer is favored with an equilibrium population of 86%. Clearly, glycosylation of a d-arabinofuranoside at O3 has a substantial influence upon the conformers available to the ring. Steric arguments can be used to rationalize these results, and similar trends are observed (Fig. 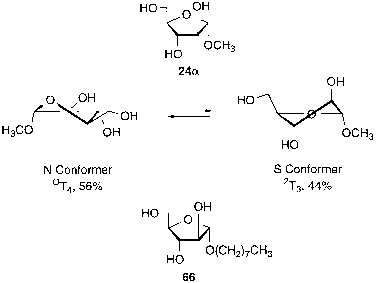 24) when these studies are carried out on the larger oligosaccharides (16, 19-21). From the data available to date, some general conclusions cn be drawn. 1. 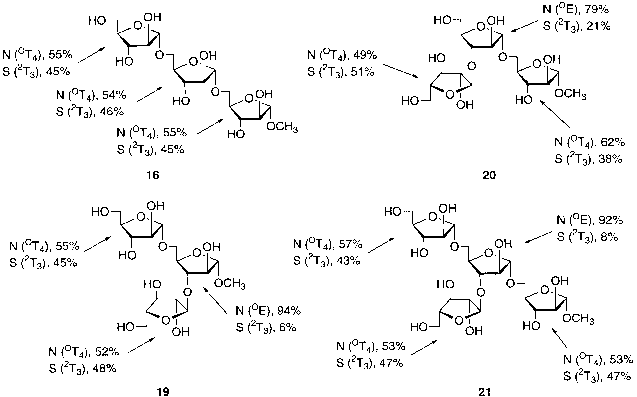 Glycosylation, and likely any form of substitution, of a primary hydroxyl group in an arabinofuranose ring does not significantly alter the conformers present or their populations. Figure 23 Ring conformers present in disaccharides 13 and 18 and their relative populations. Figure 24 Ring conformers present in oligosaccharides 16 and 19-21 and their relative populations.